Here are a number of ready-made PDF floor plan that you can download and use for free. You can use a full-featured tool that comes with built-in symbols to create floor plan, even when you are not a professional designer. It is a cross-platform program that works well on Windows, Mac os x and Linux. In architecture and building engineering, a floor plan is a drawing to scale, showing a view from above, of the relationships between rooms, spaces and other physical features at one level of a structure. The floor plan is the best visual aid for architects. 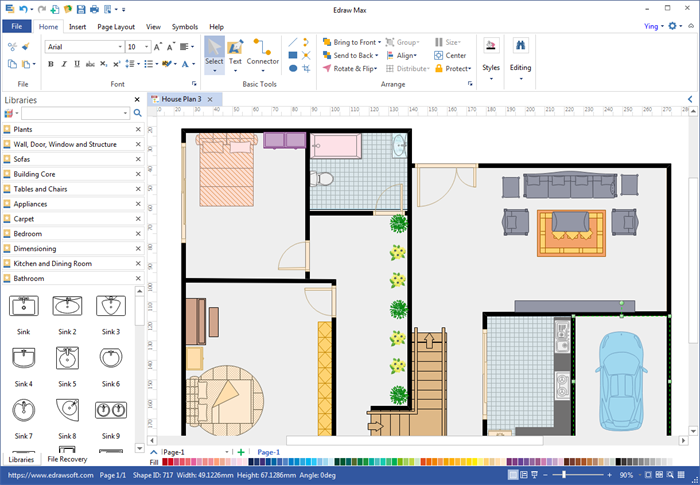 Try this easy and professional floor plan software that allows you to create floor plans with accurate size and good appearance by using pre-made elements. It has a high quality PDF export function allowing you to save your file as PDF through just 1 click. To save time, you can start with our pre-defined templates. You can also start with a blank page and use the pre-made shapes to draw unique floor plans. Shapes: Drag and drop shapes to the canvas. To add a shape, if there are floating action buttons, click them. To delete a shape, select it and press Delete. Drag the selection handles to resize shapes. Text tool: Most shapes are designed with text boxes. Double click the shape to type in your own content. Or use the Text tool to add content anywhere you want. Fill: From the Fill tab, fill your shape with color, pattern, texture or image. Background: Just drag and drop your preferable background to the diagram. Export: Click the File Menu.-> Click Export & Send.-> Choose PDF format and export the diagram. The most effective way to understand a floor plan is to put yourself in it and 'walk" around the house. As you take a virtual walk and record your sight and feelings when you get from room to room. When you read the floor plan, take advantage of the legend. The legend indicates the function of each room. Included are also graphic scale. Edraw's floor plan scale is used when the drawing gets reduced or enlarged. From the legend, you can even gain information like owners' names, project address, the architectures' information so so on. Download Edraw to Create More Floor Plan Templates for PDF. Try Mac Floor Plan Software FREE.